Forts are significant parts of any nation's history as they provide the future generations with certain shreds of evidence, which depict the glorious and miserable past of the region. There are countless forts within the boundaries of India. Certain forts date back to the early Modern Period and a few have their roots buried deep down the Medieval Period and beyond. Korlai Fort is one amongst these historical forts which showcase the lifestyle and the culture of ancient India. If you love visiting ancient places and admiring their structural formation, then Korlai Fort is certainly a place you should visit. Located on the shore of the Arabian Sea, Korlai Fort is surrounded by certain other marvels of nature and history. Read on to know everything about Korlai Fort. Korlai Fort was built in 1521 by the Portuguese under the reign of Ahmadnagar Sultanate. It came into the picture when the Portuguese felt the need to protect their territory, which was stretched from Korlai to Bassein, from other invaders. Even though it was the property of the kings of Ahmadnagar Sultanate, the Portuguese were always looking for a chance to conquer the fort. Eventually, in 1594, it was conquered by a Portuguese captain who fought against Ahmadnagar Sultanate with more than 3000 men. Later on, when the Portuguese were unable to take hold of the fort due to their small army, they decided to destroy it. Hence, today you can only find the ruins of Korlai Fort with a few intact structures. Korlai Fort is located atop a small hill and is surrounded by lush green vegetation and certain beaches. As per legends, it is said that Korlai Fort was one of the strongest forts in India and therefore, even Sambhaji, the son of great Shivaji, was unable to take possession of the fort. Even though Korlai Fort is lying in ruins today, there are still several spots inside the fort through which you can certainly learn about the history of its survival and existence. Built near the Arabian Sea, one can enjoy the panoramic views of the surroundings from the top of Korlai Fort. If you are an architecture enthusiast, then you must not miss visiting Korlai Fort. With eleven gates, large bastions and few inches of thick walls, it was considered impregnable until it was destroyed by the Portuguese. It housed 7000 horses, thousands of soldiers and a church, which was built for the army. You can also find several inscriptions on the walls of Korlai Fort. 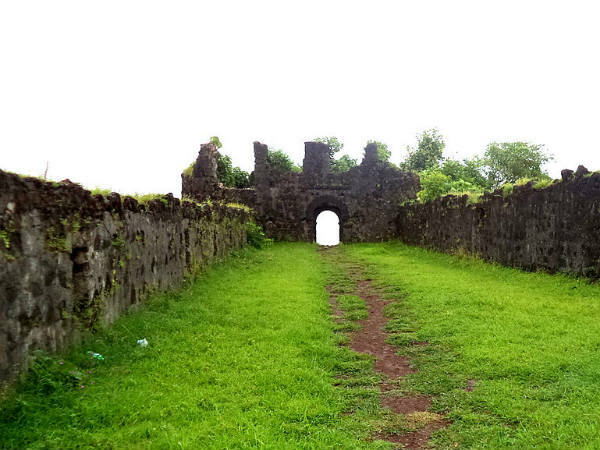 So, when there is a lot to learn about the history within the boundaries of Korlai Fort, why not get yourself here? Apart from enjoying the surreal location and architectural beauty of Korlai Fort, you can also explore its beautiful surroundings. There are several places of interest located in the vicinity of Korlai Fort and hence, are easily accessible. The major places which you must not miss visiting while at Korlai Fort include Alibaug Fort, Janjira Fort, Nagaon Beach, Revdanda Fort, Kankeshwar Temple and Kashid Beach. Isn't it a wonderful place surrounded by so many beautiful sites? So, why not plan a trip to Korlai Fort now? Being a historical monument, Korlai Fort is a year-round destination for history lovers. However, if you are looking to spend your time exploring the history and the surroundings of the fort in a cool and pleasant weather, then the best time to visit Korlai Fort is from October until the end of April. By Air: The nearest airport from Korlai Fort is located at Mumbai at a distance of around 120 km. After reaching the airport, you can hire a cab to Korlai Fort. By Rail: Pen railway station is the nearest railway station at a distance of around 50 km from Korlai Fort. From the railway station, you can hire a cab to Korlai Fort. By Road: Korlai Fort is well connected to cities and towns by road.